Less Is More....an unlikely business scenario. Exactrix owners report 12% more net margin... from $100,000 to $1.5 million additional annual net margin. The total investment is often paid for in the first 2,000 acres. Award winning high speed tool bar, Friend, NE. Orthman, Bourgault, & Exactrix. 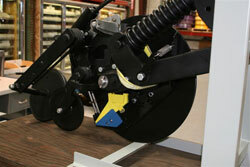 Exactrix USDA Tool Bar, P-51 Mustang Swiveling Single Disc Openers. Practicing five annual factors brings good yields and excellent nutrient efficiency. 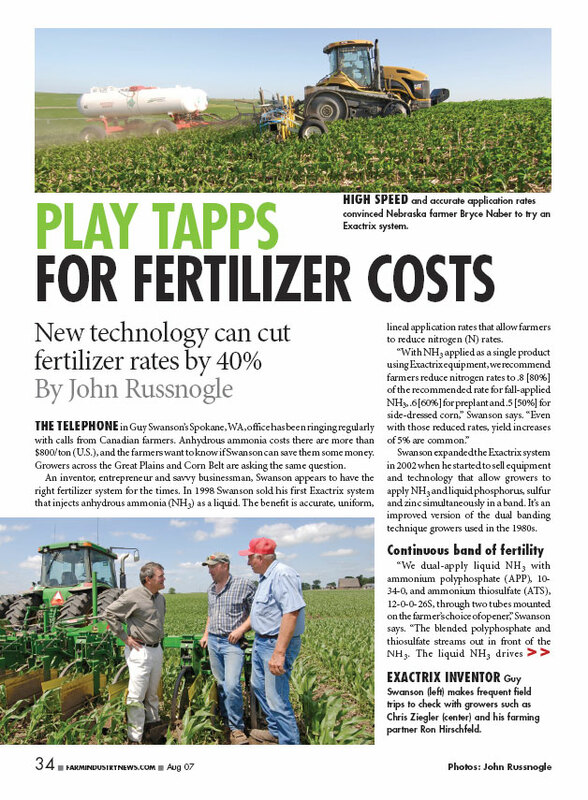 Apply 166% more crop available N and 200% more crop available P with TAPPS. 2. Uniformity, lineal stream, exact band width with every band on every acre on every field....exactly applied. 4. TAPPS formulation of balanced nutrients. 5. 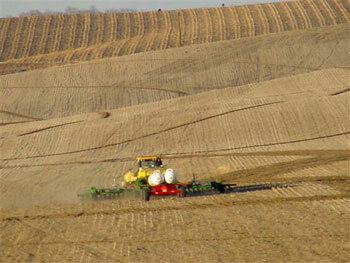 No-Tillage practices provide additional nutrients timely. 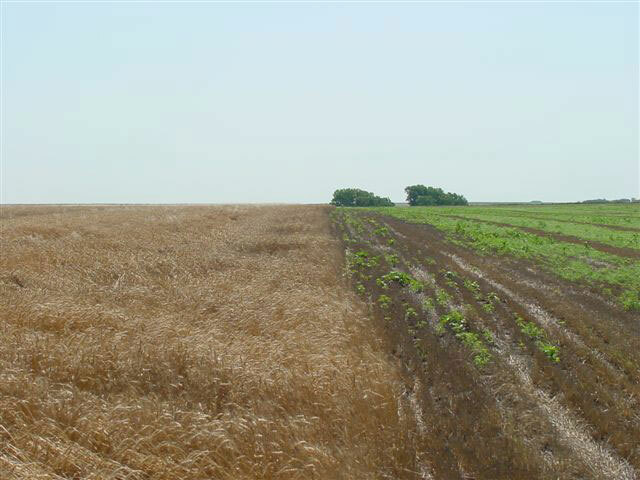 Practicing three perennial factors improves yields and nutrient efficiency. 2. No-tillage, Rotational Band Loading. 3. Adjusted soil pH. Optimum 7 to 7.5 pH. June 23, 2006 Yuma, CO Steve McCasland, side dressing, single disc. October 2008 Genesee, ID One pass campsite. Logistics are important. Each opener band is applied within 1%, formulating TAPPS. The TAPPS band width is exact. The band concentration or the band width or the band diameter remains constant across the applicator pass. There is no over and under concentration of nutrients. Over concentrated bands cause root burning and or pruning. The bands are homogeneous with zinc and sulphur and phosphate combined with ammonic nitrogen feeding plants with a balanced nutrient crystal band. 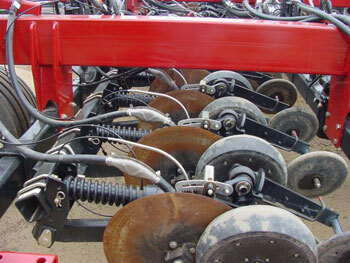 Single Disc Openers allow side dressing right after planting. Low disturbance P-51. 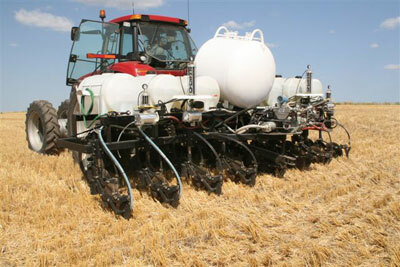 Bourgault MRB-25 single disc openers injecting TAPPS. Scott City, KS, Chris Winderlin pre-plant and side dresses irrigated production with this award winning tool bar. 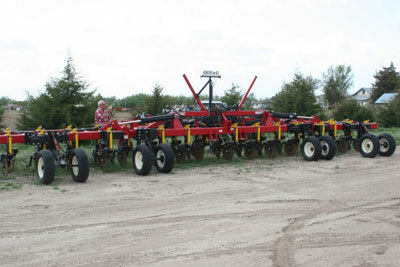 Moore-Built, Bourgault, Exactrix is conjoined. Index the banded nutrients with guidance. 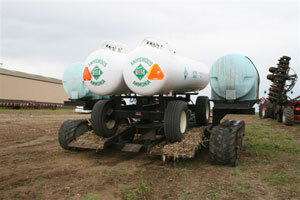 Setup NH3 trailers to pre-plant or side dress. Consider side dress on sandy soils. 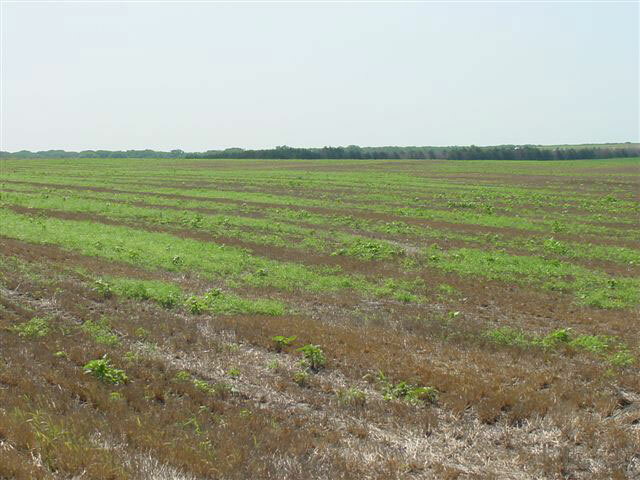 Consider pre-plant application on 2/3 of your acres. and low disturbance side dress applications. Start side dressing immediately after planting. 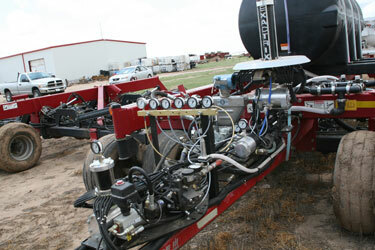 Design your tool bar and trailer to handle big corn. Hedge your bets...keep your options open. 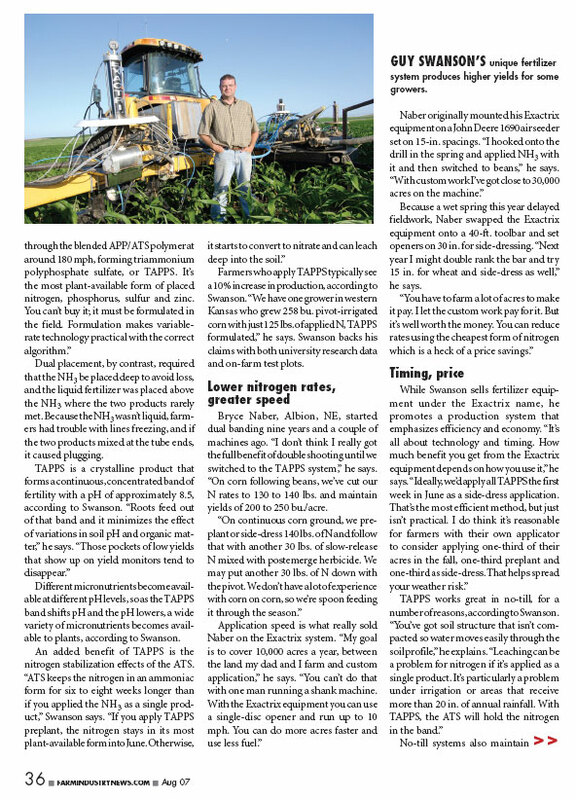 Maximum nutrient efficiency and top yields may require two passes formulating TAPPS. Qualification for Tier 3 CSP is possible. 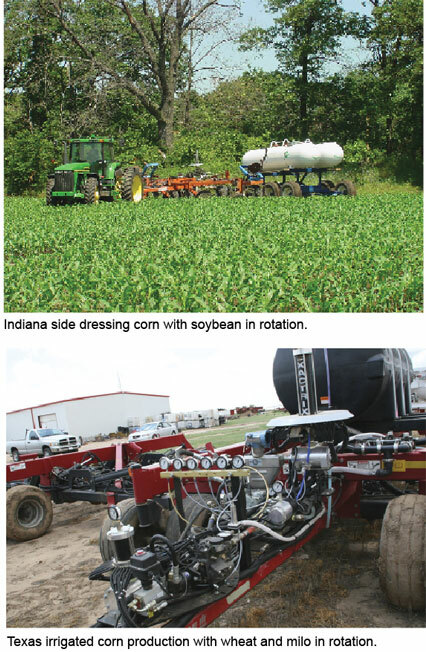 Timing drives crop production decisions. by specific gravity and weight at 11.40 lbs per gallon typical, APP. 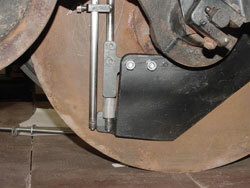 Weighs the material as it is applied and confirms proper manufacture of 10-34-0. Double crop side dress sunflowers with swiveling P-51 Mustang openers results in virtually no soil disturbance. 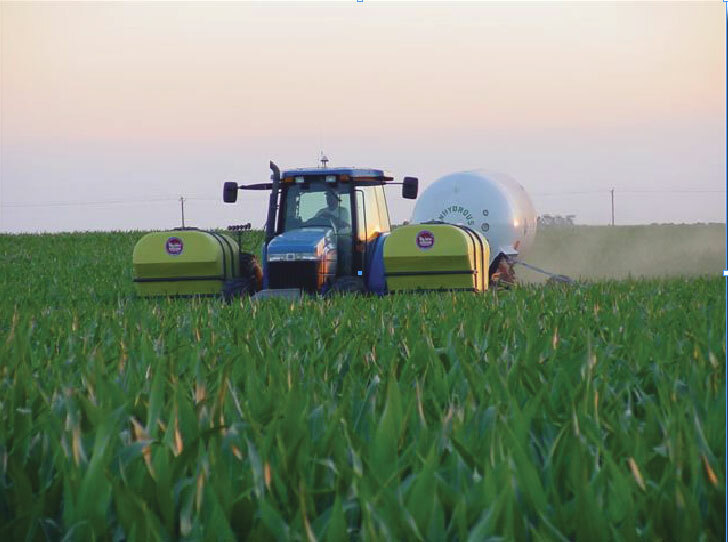 At Colby, KS, side dressing or indexed pre-plant application brings best returns. 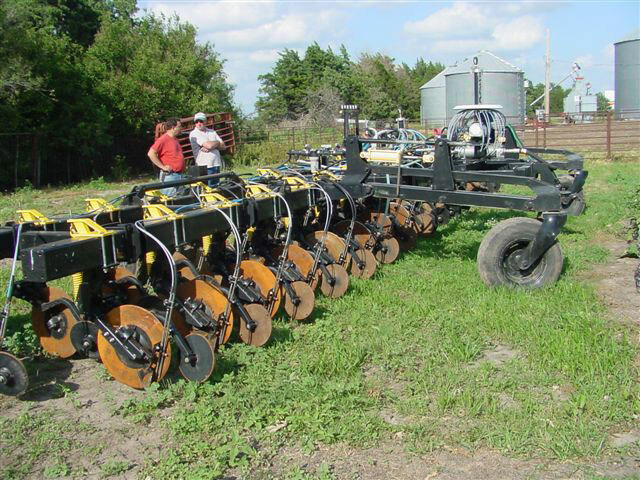 No-till single disc application provides flexibility in all soil types. Maximum nutrient efficiency with applying TAPPS into growing roots. Excellent yields with timing of Exactrix TAPPS Formulation. Apply 166% more crop available nutrients. Add 12% more net margin. 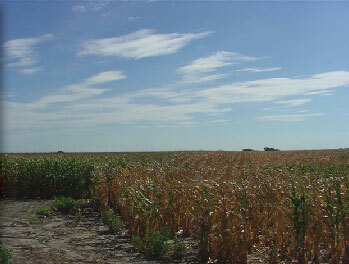 In irrigated corn production producers bring 150 more net dollars per acre to the bottom line in 2008. Change fields without changing tanks. 2KC Weigh Master, weighs NH3 as it is applied. Deere 1890, 1990, an ideal pre-plant banding tool, 10, 12, 15 inch spacing. Series 800 Case SDX, TAPPS Formulator, seeding and banding, and banding only. 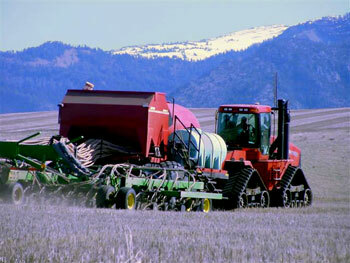 Lovell and Cook, Ririe, ID, 25 years continuous no till at 5,200 feet. 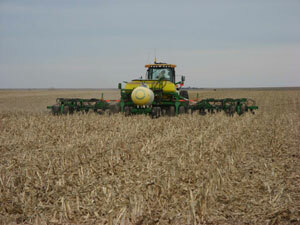 Spring wheat seeding with a Deere 1895, AGPro seed metering, Yielder Drill and Exactrix. Case SDX, 10 inch seed row spacing, ideal Exactrix tool. Mott, ND. 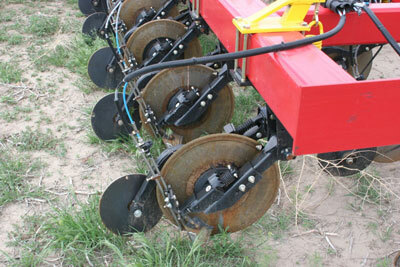 High Speed Single Disc Openers Place Nutrients Without Tillage. 1. Pick the opener group that matches your system. 2. Pick the machine that matches your rotation. 3. 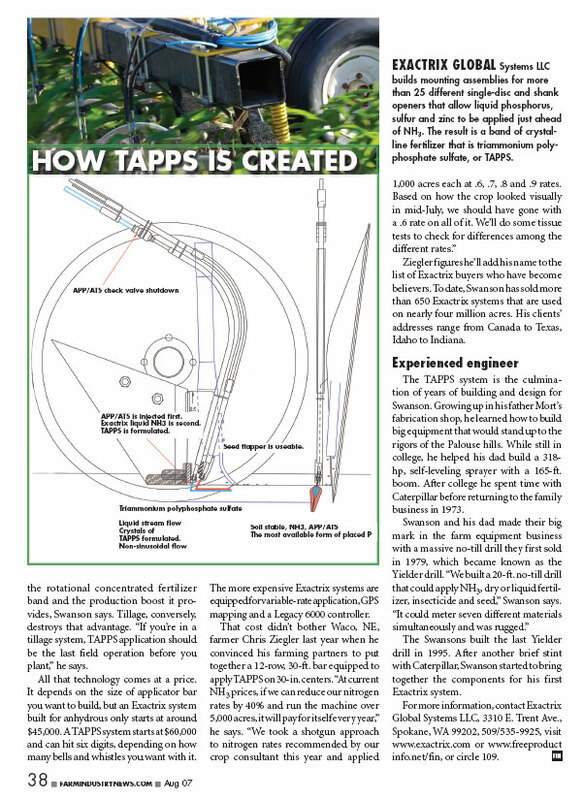 Formulate TAPPS to match your crop needs. 4. 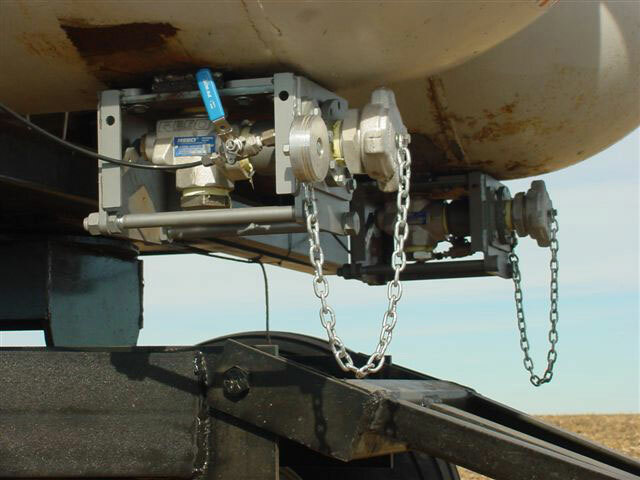 Maintain a Rotational Band Loading System. 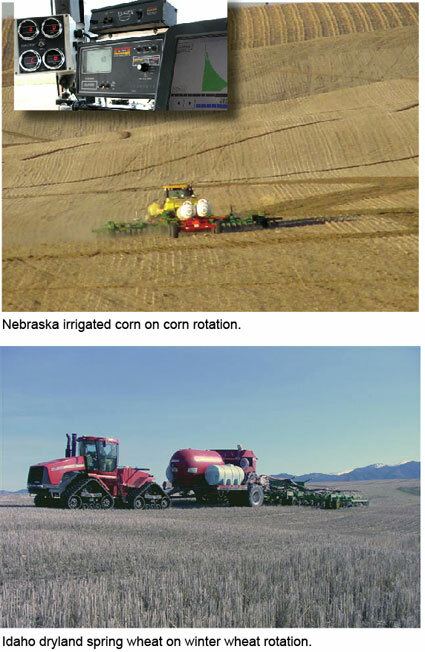 Albion, NE, a single pass winter wheat system or a two pass winter wheat system with the Deere 1690 CCS. 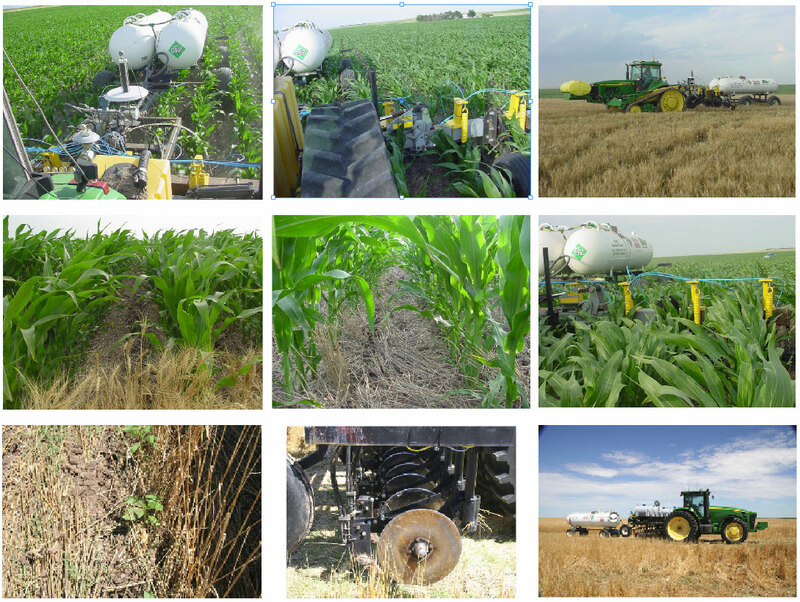 A pre-plant nutrient tool for corn production. 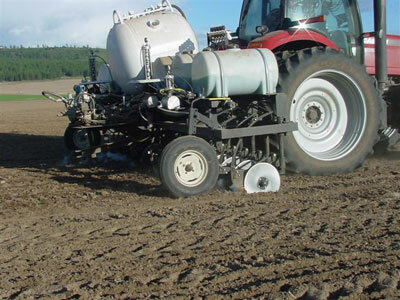 The first seeder to fertilize soy beans with wing injection of NH3, APP/APS. A two pass no-till applicator. Fertilizing winter wheat in side dress late fall application with a Case SDX 15 inch band center. 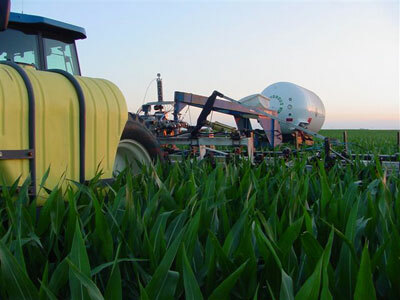 The SDX has 32 openers and applies nutrients in the spring for irrigated corn production. Application speeds are 7 to 8 mph. No-Till pre-plant corn production using single disc drills. 2. Excellent return on machine investment. Excellent reports from producers with milo, corn, soybean, canola and winter wheat rotations. 3. 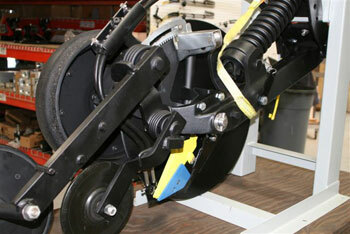 Allows radical root access for soybean and wheat. Soybeans can be fertilized. 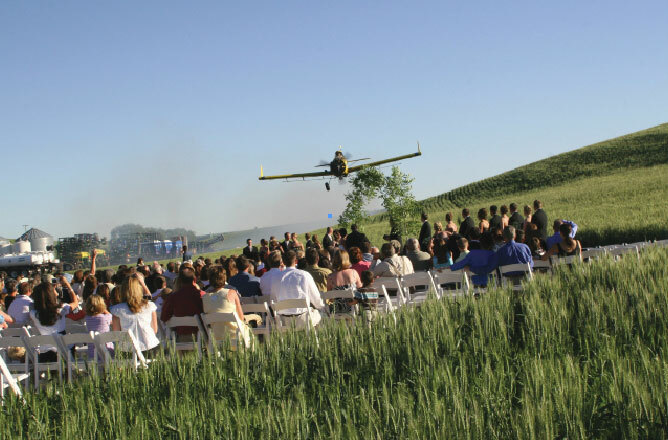 Wing injection starves the weeds, feeds the crop. 4. Setup on 10 inch spacing for best corn root geometry in pre-plant corn production. 5. Allows side dressing of winter wheat. The 10 inch drills are ideal for all rotations with wing injection.... 10 inch beats 7.5 inch spacing. Deere 1895 mid row banding can be set up Paired Row. A good tool west of the Continental Divide. Deere 1890 wing injection will also fertilize soybeans. A powerful tool on the Great Plains. Exactrix 2 inch RT valves with guarding and parking caps. Approved in all states. Easy and safe connections with remote bleeder lines and safety rope shutdown. 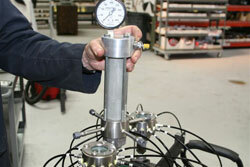 Exactrix Bottom Outlet Internal Valves Save Time and Money...Safer!! Exactrix two inch RT internal valves shown at 40 gpm nominal...twin tank 80 gpm nominal. 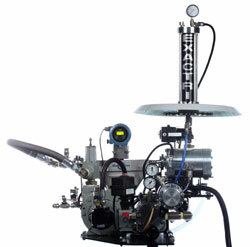 Exactrix three inch internal valves are offered for large single tanks at 80 gpm nominal. 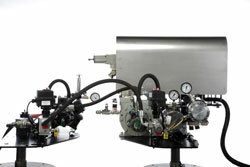 In airseeder applications twin tanks are required with 1.25 inch internal valves at 20 gpm nominal. 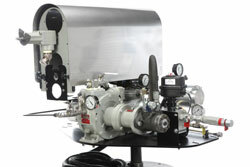 Top outlet tanks are approved in twin tank application to 14 gpm nominal. 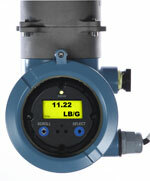 Single 1,500 gallon tanks are rated to 12 gpm with the A-479 ST 1.5 inch top outlet valve. Twin tank top outlet A-479 valve rated 24 gpm. Understanding tank flow capacity is critical in system engineering design to assure cold weather performance. Your Exactrix sales engineer will design the tank supply system. Compatible with ISO BUS terminals Multiple section controlled with auto boom. 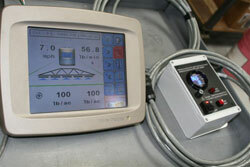 Also available with Data Link connection for Raven, Ag Leader, Trimble Mapping Controllers. Write your application VRT at .6 of the soil lab recommendation and bring a great return to the bottom line. Reduce risk. Full VRT response in 1.5 seconds at the injection point at pressures from 10 to 350 psi with dual stage orifice flow...a 50x regulated flow margin. For the first time in the history of the Kramer Seed Farm the land has been fertilized exact. The streaming band width is exactly the same. Each band is identical within 1%. Every acre band is applied within 1%. The applied field rate is within 30 lbs. on 10,000 lbs. applied irregardless of temperature. The bands are not defused. The soil micro flora has difficulty accessing the uniform tight bands. The soil micro flora reject the bands as distasteful due to the acid base reaction. One of the secrets... streaming liquid flow with a standard band width that is non-diffused. produces a new understanding of nutrient efficiency. 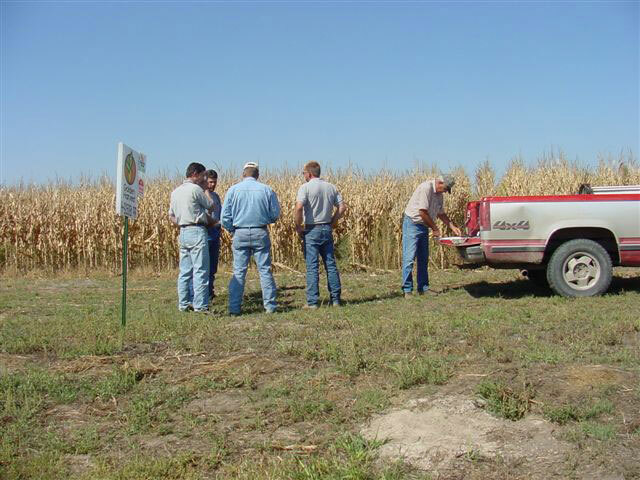 Exactrix owners receive $1000 for valuable nutrient management data. Results of test plots indicate nutrients are over applied.... Why? Non uniform application of the "old fashioned" metering systems and poor timing. 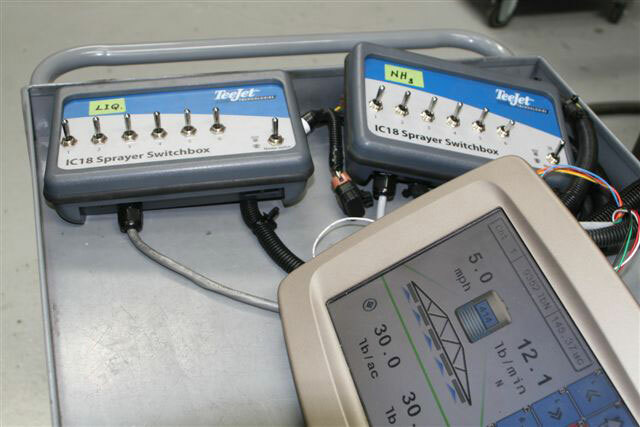 Wheat considered... Exactrix TAPPS No-tillage systems compared to tillage systems. Produced 80 bushels per acre over 2 years. 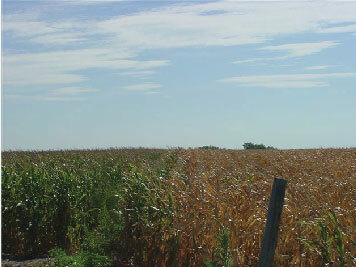 Contrasting Systems, Quinter, KS, 2006, side by side comparison. Economics visually explained. 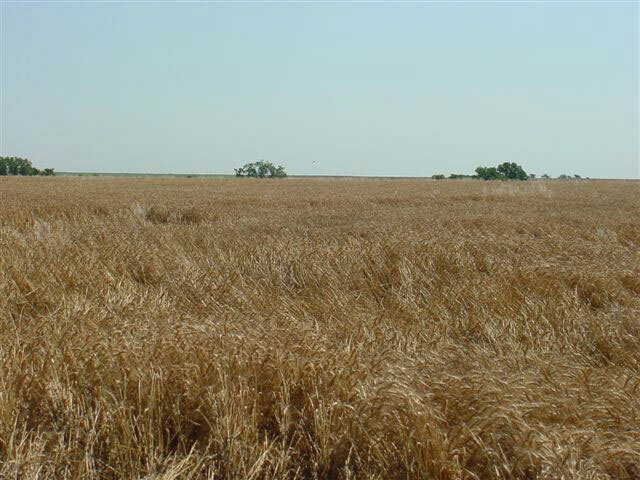 Summer fallow winter wheat-tillage system produced six bushels in two years. 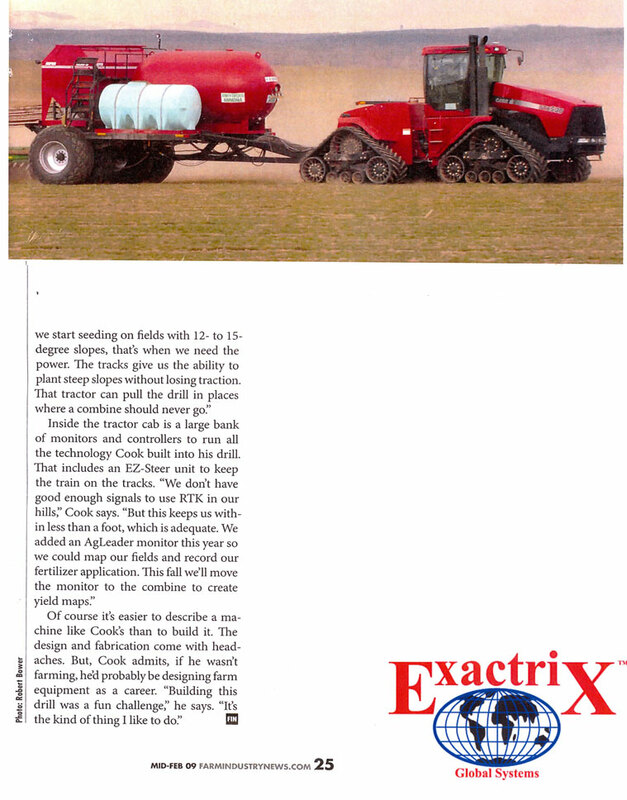 Corn considered... Exactrix TAPPS No-tillage systems compared to tillage systems. Annual No-till corn on winter wheat stubble of 2006 with Exactrix TAPPS rotational band loading. On the left pre-plant nutrients applied no-till with Exactrix Deere wing injection. 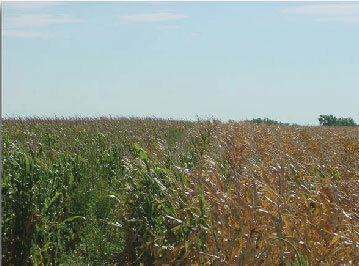 Contrasting Systems, Quinter, KS, 2007, Same two fields from 2006 in a side comparison. The Exactrix owner was so proud of the decision to implement Exactrix technology. His pictures show the tremendous difference. Tri-Ammonium Poly Phosphate Sulfate or TAPPS. Typical 10% yield increases proven time after time in variable pH and variable OM soils. Reduced use of N, P and S…Up to ½ the amount required compared to dry urea and dry P and S.
Formed at 800*F by super-ammoniation only with liquid NH3 mixing APP and ATS. Acid base reaction. An all weather friend in liquid, low CV application at 1% variance. Dry fertilizer is not competitive. No sinusoidal flow…an uninterrupted flow of two liquid materials forming crystalline TAPPS. 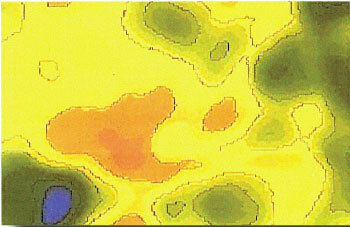 Physical state-liquid state, high pressure at the injection point. 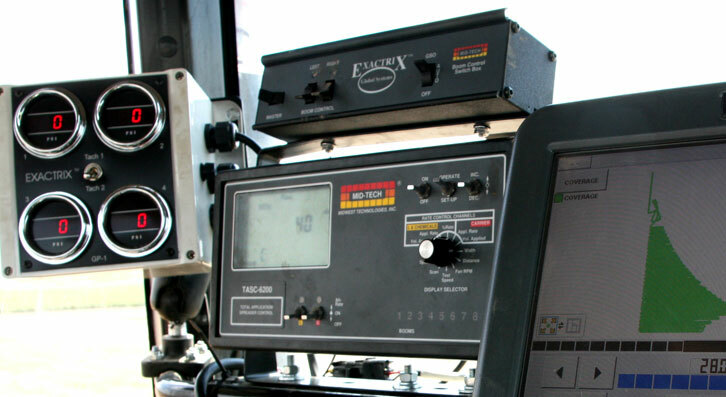 Unique to Exactrix…with process control, timed shut down, no freezing lines and assured mixing. Crystalline Tri-Ammonium Poly Phosphate Sulfate or TAPPS...A polymer with balanced homogenous mixing producing 166% more crop available and balanced nutrients. A major achievement following 35 years of development. A continuous streaming flow with no irregular band concentration allows the plant roots to access the nutrients without root pruning or burning. 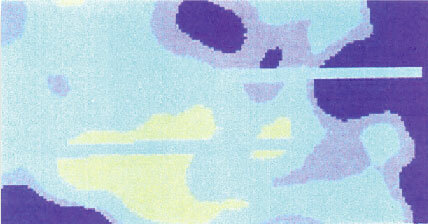 The homogenous blend polymer is crystallized in an acid based reaction. Uniformity and reaction result in 166% more crop available nutrient. Each port outlet is within 1% CV allowing each corn row to feed evenly. Critical mixing of the two materials below the ground line. Each wheat row feeds on a dedicated band in a balanced uniform blend of N, P, S, and Zn. Technical Discussion, Tri-Ammonium Poly Phosphate Sulfate, TAPPS. 1. Can not be purchased….TAPPS is manufactured dynamically with an Exactrix Mid-Tech process control system. 2. The most plant available form of placed N, P, S and Zn. 3. Super ammoniation of a balanced nutrient package. Produces a hair root target 100 times greater diameter than a single product application of Ammonium Poly Phosphate, 10-34-0, 11-37-0, and ATS, 12-0-0-26S. 4. 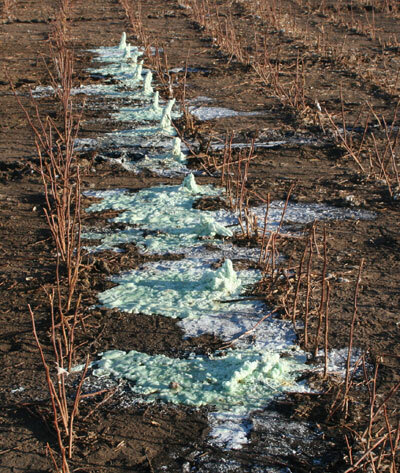 The crystals of TAPPS chemically reduces the ability of soil calcium to tie up or sequester placed P. Crystalline TAPPS remains available for future crops without tillage. Rotational Band Loading reduces P requirement. 5. Ammonium Poly Phosphate is required. Ammonium Thio-Sulfate is required. NH3 is required. 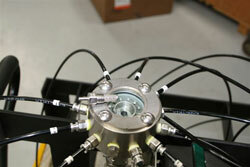 The three materials must mix and formulate with two intersecting streaming flow columns. The crystals must be formed. 6. Typically formulated as a 60-15-0-7S-1Zn. The three materials can be variable rate applied. N, P and S rates can be adjusted to match soil pH, soil available P and soil mobile SO4. Zn ratio is no less the 18 to 1 in relation to P.
7. 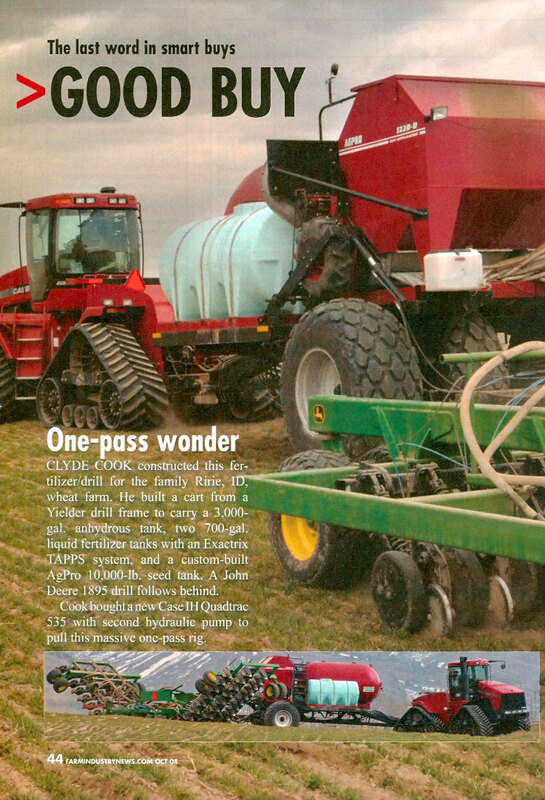 Known for 40 years to be the best method for fertilizing wheat and corn….and now it is practical. 8. Shifts the applied band pH to 8 to 8.5 allowing micro nutrients to become more available as band pH shifts in time from above 7 to below 7. Reduces the chances of hydrogen being stored in the soil. The plant can pull hydrogen directly. If timed properly the plant can directly pull NH4 from the crystals of TAPPS. Thus reduced soil acidification potential. 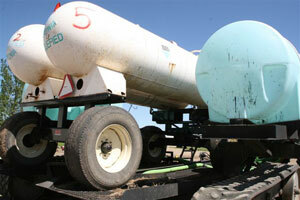 TAPPS delays the conversion to mobile nitrate. 9. Ammonium Thio-Sulfate or ATS is a nitrification inhibitor…and a plant nutrient. The cost to stabilize the band and reduce leaching is about half of other methods. ATS is listed as a plant nutrient and a nitrification inhibitor... NRCS approved. 10. Chevron Chemical, Ortho Division came close with the Unipel design…but no super-ammoniation and no pH shift, plus the sinusoidal flow of a dry prill when banded and high CV application port to port of dry fertilizer. 11. Exactrix test plots confirm that yield curves come up early and fast at low rates and then drop backwards when TAPPS is over-applied. See Exactrix Test Plot Summary. Yield limits are often related to other factors e.g. compaction, moisture infiltration, heat index at pollination. 12. TAPPS was pioneered at WSU, MSU, KSU and UNL….but never brought to a true state of perfection until recently at Exactrix with the help of the Fluid Fertilizer Foundation and Dr. Larry Murphy. 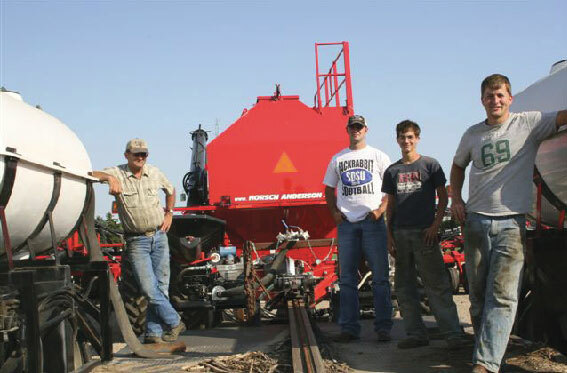 Young farmers can expand their operation with Exactrix high speed tool bars.Young farmers can save millions of dollars following Exactrix guidelines in crop production. Risk is reduced and a 12% greater margin results. Exactrix...Improving Production Economics, Improving The Environment And Reducing Risk. 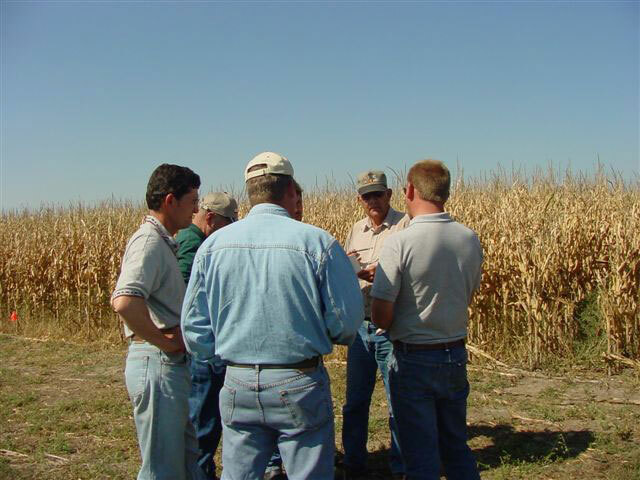 Meeting the Needs of the Most Advanced Corn, Cotton and Wheat Producers. Meeting your needs with Exactrix precision liquid direct injection of NH3. 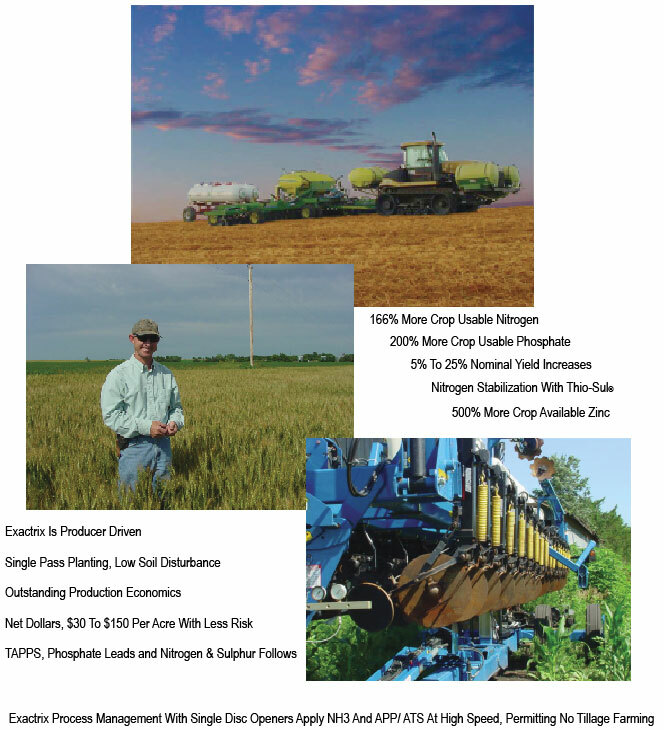 Apply NH3 uniformly with up to 166% more crop usable N and 200% more crop available P.
Yield increment increases of 10% to 20% are considered average using Exactrix and timing, without tillage and TAPPS. 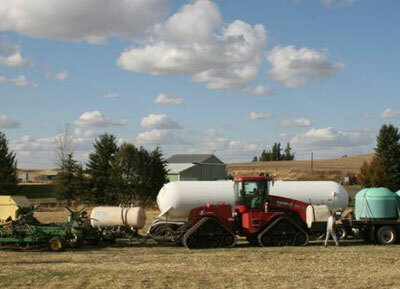 Exactrix application is adding between $30 and $150 per acre of additional net return to producers with low cost NH3. Corn returns are greater. The success stories keep coming in.....you can review producer comments with an Exactrix CD. Watch how you can get better margins. Exactrix producers apply dual placement products NH3/APP/ATS forming TAPPS in single pass and dual pass production systems. For the first time...placement of NH3 is stabilized without tillage...forming TAPPS. Greatest possible net margins with TAPPS. South Dakota Corn, Soybeans and Wheat. Mass meter confirms total pounds applied within 30 lbs on 10,000 lbs. applied. 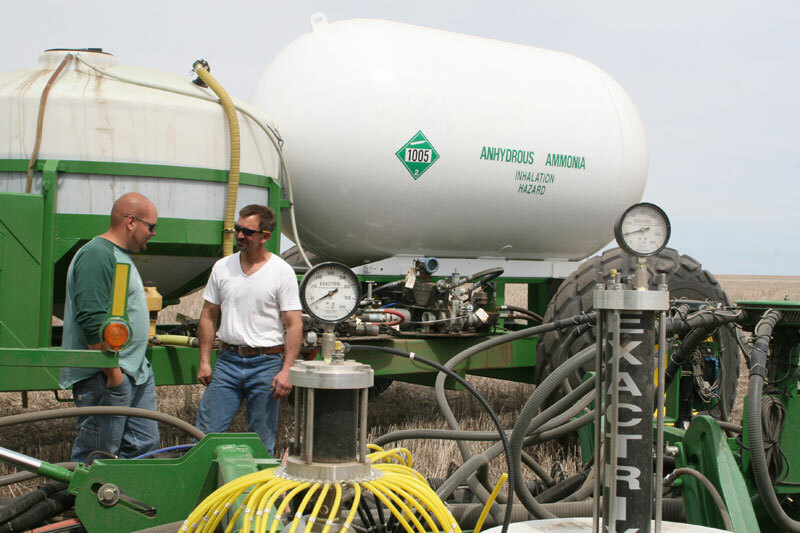 Mass flow is the most accurate method to weigh NH3. All applications are by weight. 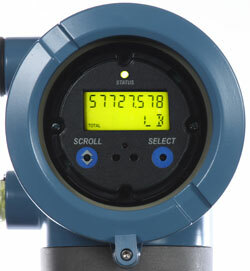 Totalizer readout allows the producer to change fields without weighing tanks. The totalizer readout is tamper proof. Right to the bottom line...$30 to $150 per acre additional net. and 200% more crop usable Phosphate with all Exactrix systems. 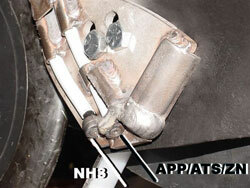 Any soil opener can apply NH3, APP, ATS with Exactrix Direct Injection Liquid NH3 systems. 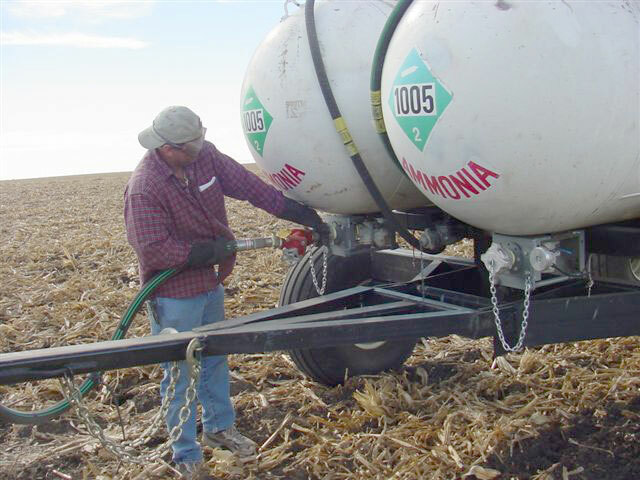 NH3, 82-0-0, APP, Ammonium Poly Phosphate, 10-34-0, ATS, Ammonium Thio Sulfate, 12-0-0-26S. 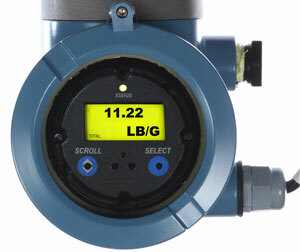 The 2KC Weigh Master system has a Coriolis mass flowmeter that weighs the NH3 as it is applied. Top outlet tank valve approved. 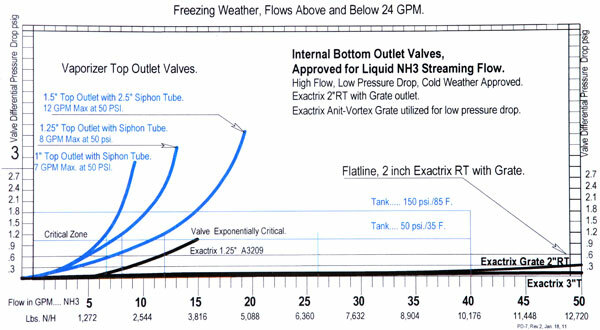 Top outlet tank valves reduce application volume over bottom outlet valves. This means that the 2KC Weigh Master cannot apply as many gallons per day as the 2KD Weigh Master. The 2KC Weigh Master systems starts at 12 port arrangements. Dual manifold arrangements to 96 ports. 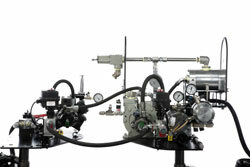 The 2KC is rated to 24 gpm with twin tank, 1.5 in. top outlet valves. The 2KC is bottom outlet internal valve rated to 30 gpm. 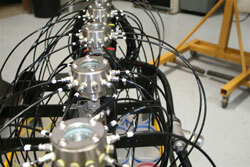 The 2KD Weigh Master system starts at 12 port and goes to 96 port in dual manifold arrangements. 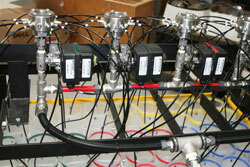 This mass flow system weighs the NH3 as it is applied. Applied field rates are within 0.3%. You can challenge the fertilizer dealer mechanical scales with this powerful metering and weighing system. 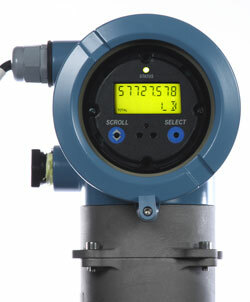 The Coriolis mass flow meter has no moving wetted parts. Applied CV’s are well below 1% port to port. 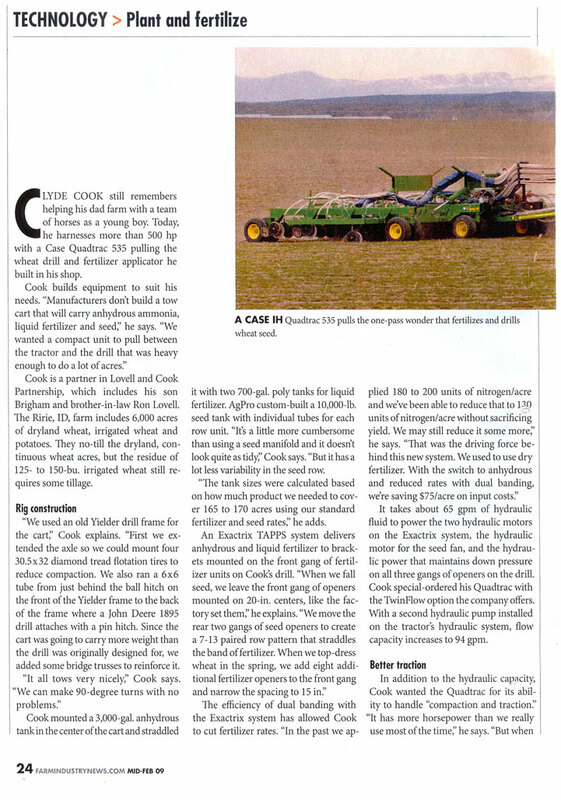 The 2KD system is used by large farming operations. 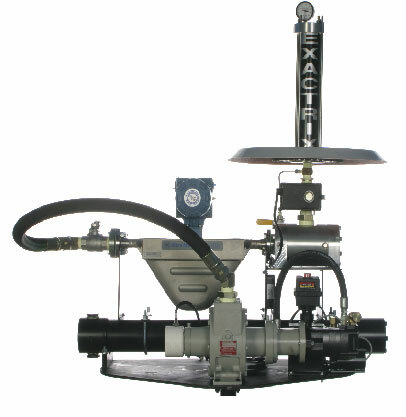 The 2KD has the lowest operating costs of all Exactrix systems using a sliding vane commercial pump. The Elite custody transfer system maintains accuracy within 0.1%. You can bill the customer or the landlord from the tractor seat. The 2KD system is bottom outlet approved to 72 gpm. as compared to other fertilizer types and methods. Dual placement means 200% more crop available phosphate/sulfate with Exactrix. Nitrogen stabilization results from TAPPS Formulation. The 2KP systems start at 12 port & all the way to 96 port in dual manifold arrangements with Mid-Tech control. High port accuracy for dual placement. The Mini-Man manifold accurately delivers liquid APP and ATS at all flow rates with no orifice changes....forming the crystals of TAPPS. Low 1% CV delivery in port arrangements to match all tool bars and airseeders. 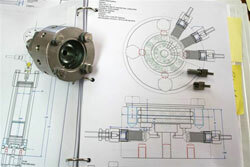 Available with opener mounted check valves for sequential start-up and shutdown in dual placement NH3, APP/ATS. 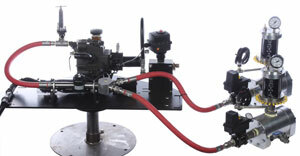 The 2KP 308 has flows to 8 gpm. The 2KP 313 has flows to 13 gpm. 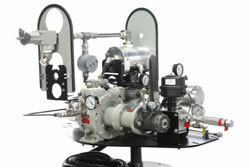 Both systems have pressure ratings of 300 psi. 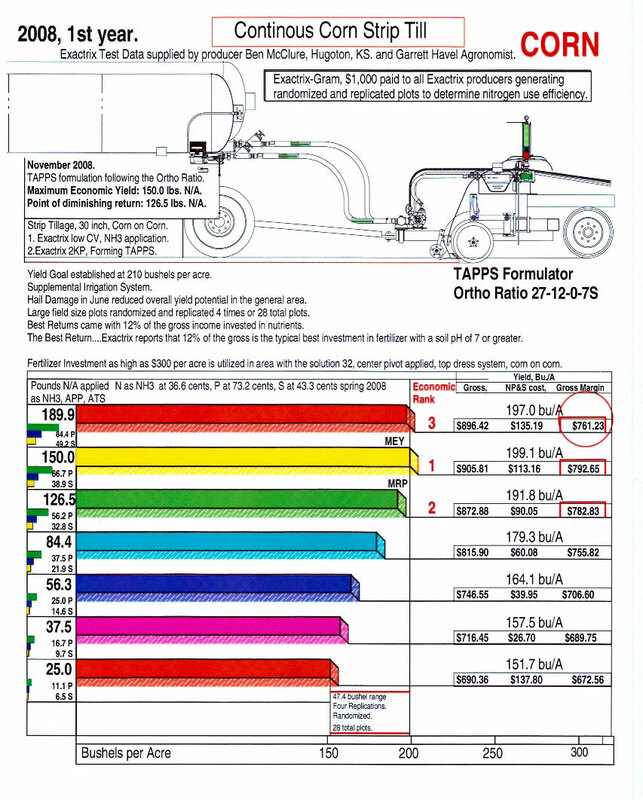 Higher flow rates may require the 2KM TAPPS formulator. flow reading specific gravity. Confirmation of each batch and critical analysis of nutrients is assured with Exactrix unique specific gravity readout. Specific Gravity is accurate to .002. THIO-SUL® 12-0-0+26S, (ammonium thiosulfate). THIO-SUL® is the original nitrogen-sulfur plant nutrient solution instrumental in unlocking the full potential of your fertility program. THIO-SUL® is a clear liquid containing 12% nitrogen (N) and 26% sulfur (S). THIO-SUL® is compatible with N solutions and complete (N-P-K) liquid blends, which are neutral to slightly acid in reaction. In addition to its wide adaptability for use in clear liquid blends, it is also well suited for use in suspensions. THIO-SUL® aids in increasing crop yields and stretching your fertilizer dollars by improving and stabilizing the Nitrogen-Sulfur ratio. It helps in maintaining necessary sulfur levels in soils that are sulfur deficient. THIO-SUL® helps solubilize and aids in plant assimilation of other essential plant nutrients such as phosphorus and increases plant utilization of several micronutrients, i.e., zinc, manganese, iron and copper. Thiosulfate as a Sulfur Source. The advantage of thiosulfate, in comparison to other sulfur forms, is that the sulfur needed for plant growth becomes available over several weeks. Thiosulfate helps supply the plant’s sulfur needs quicker than other sulfur forms. THIO-SUL® as a Nitrogen Stabilizer. University research has shown THIO-SUL® can reduce potential loses associated with nitrate leaching and amonia volitization when blended with UAN solution resulting in more nitrogen being available to the crop. THIO-SUL®, when added to UAN solution at 10-20% volume to volume ratio, delays nitrification resulting in a decrease of potential losses from nitrate nitrogen leaching. In addition, when THIO-SUL® is added to UAN solution losses associated with amonia volitization may be reduced. THIO-SUL® contains 1.32 pounds of nitrogen and 2.87 pounds of sulfur per gallon. THIO-SUL® weighs 11.05 pounds per gallon. Consult the THIO-SUL® application guide for rates and timing of application. ....for big producers. 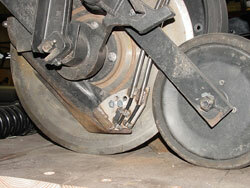 Track carts bring improved productivity and good returns. 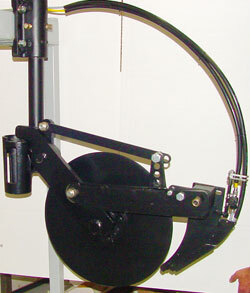 Carts are commercially available through Exactrix.